Chitosan Market size surpassed USD 1.5 billion in 2017 and will witness a CAGR of more than 20% between 2018 and 2024. Rising water treatment activities mainly in Asia Pacific is anticipated to boost product demand, which will have subsequent impact on the overall chitosan market size in the coming years. Product is extensively preferred as a flocculant to treat wastewater. It is an effective coagulant for organic as well as inorganic compounds which are present in the water. It can also be used as a chelating agent to bind highly toxic heavy metals, often present in industrial discharge water. Furthermore, it acts as an adsorption medium for various industrial chemicals, such as phenol and PCB which exist in wastewater. Chitosan is increasingly finding acceptance in wastewater treatment technology owing to its easy availability, biodegradability, and non-toxic nature. Depleting ground water level and rapidly growing urban population, and industrialization in Asia Pacific have resulted in the acute scarcity of usable fresh water. This has led to massive investments and policy formations by governments and private players in water treatments mainly in China, India and Malaysia. For instance, Clean India Mission of India has allotted USD 21 billion to ensure all households in rural areas have functional water supply. Additionally, another policy formulated by China government (Water Ten China) in 2016, aims to improve quality of surface water, coastal bays, groundwater and drinking water supply in key cities and regions of China. The aforementioned trends are likely to boost product demand in the region, which will help drive the chitosan market size over the forecast spell. High production cost is a major restraining factor, which is likely to hamper the overall chitosan market size during the forecast timeframe. The production involves the derivation of commercial-grade chitosan from crustacean shells, mechanical grinding, washing, decalcification of shells, and deproteination to arrive at chitin, which is further deacetylated to obtain chitosan. The degree of deacetylation of chitin determines the quality of chitosan. These processes are time-consuming and require close monitoring. However, biodegradability, and non-toxic nature and applications across several end-user industry will generate ample opportunities for the chitosan market size in the coming years. 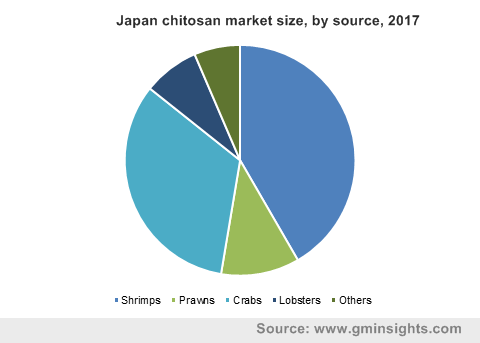 Shrimps based chitosan market size constituted more than 40% of the total industry share in 2017. The production process of chitosan from shrimps involve washing shells thoroughly with water to remove impurities, which is followed by chitin production by homogenizing shells in a blender into small sized pieces. Further process involves demineralization of shell by using hydrochloric acid, deproteinization using sodium hydroxide and finally generating chitin, which undergoes deacetylation to produce chitosan. The product finds wide-spread applications across several end-user industries such as water treatment, cosmetics, food & beverage, agriculture, among various other end-users. 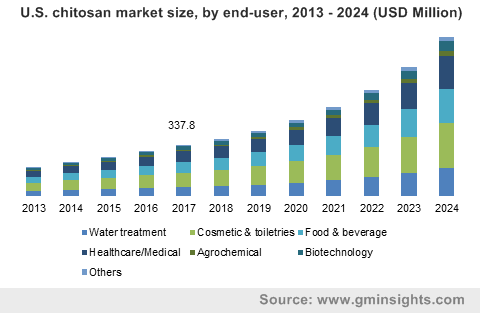 Chitosan market size for cosmetics/toiletries segment is projected to witness gains closer to 18.5% in the coming years. This is mainly attributed to its application in manufacturing anti-aging creams. For instance, retinol—the main active ingredient in anti-aging cosmetics is extremely unstable under the influence of light, especially at elevated temperatures. However, when introduced into a chitosan matrix, it is stable and more effective than any other commercial retinol delivery system. Chitosan is a commercially viable substitute for hyaluronic acid, which is used widely in anti-aging cosmetics. Apart from skin care products, product is also used to manufacture hair care and oral care products. It has the ability to form an elastic film on hair, thereby imparting softness and physical strength to hair fiber. It is used in shampoos, styling gels, hair sprays, and hair colorants. Moreover, it is also used to manufacture toothpastes, mouthwashes, and chewing gums as it has anti-plaque and anti-decay properties. North America led by the U.S. chitosan market is projected to witness gains close to 18% in the coming years. This is mainly attributed to strong pharmaceutical sector in the region as key players such as Pfizer Inc., Merck & Co., Inc. and Johnson & Johnson, etc. are based in South and Central America. Furthermore, North America contributed nearly 40% in the global pharmaceutical market in 2017. Additionally, new advancements and ongoing research in the biotechnology field for manufacturing bio-based medicine with natural ingredients is likely to contribute significantly to product demand, which will generate higher gains to the chitosan market size in the coming years. Chitosan market share is highly fragmented due to prevalent number of large, medium and small scale manufacturing companies. 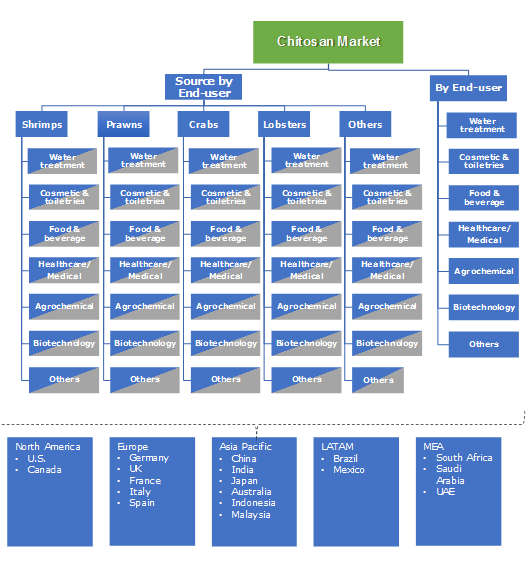 Some of the prominent chitosan market share players are GTC Bio Corporation, Panvo Organics Pvt., Ltd., KitoZyme S.A., and Xianju Tengwang Chitosan Factory. Others significant industry players include FMC Health and Nutrition, Golden-Shell Pharmaceutical Co., and PT Biotech Surindo. Most of these players are making investment in research to expand its product portfolio and gain competitive advantage over its competitors. For instance, KitoZyme S.A. attained marketing authorization for two new products namely Gastrap and FiberSlim in December 2016, in the European market. These products are used in treating intestinal disorders and this move was intended to develop partnership with France, Germany, Italy and Poland. Chitosan is a chitin derivative, and is a long chain polymer found abundantly in aquatic animals such as crabs, shrimp, lobsters, prawns, etc. The global chitosan market is extremely attractive as this polymer has extensive applications ins various end-use industries such as water treatment, food & beverage, pharmaceutical, cosmetics, biotechnology, pulp & paper, and agriculture, among others. Extensive research and development initiatives continue to be undertaken in order to ascertain other future novel applications of chitosan.